Avian influenza (AI) is a viral disease of domestic and wild birds. The recent pandemics caused by highly pathogenic AIA (H5N1) in domestic poultry is currently rated phase 3 by the World Health Organization on the pandemic alert scale. Materials and Methods: A pretested and semistructured survey instrument was administered to both live bird market and poultry farm workers in two most populous cities in Karnataka in South India to collect data on demographics, knowledge, attitude, and practices among them. Results: The mean age was similar among both population groups (31.5 years). There was a higher level of biosecurity practices adopted in poultry farms compared with those adopted in live bird market. Knowledge regarding AI was acceptable but poorly correlated with actual biosecurity practices. Discussion: Live bird market and poultry farm workers have been identified as the weakest link in the prevention and control of the spread of AI in the two most populous cities studied in Karnataka. Conclusion: Risk reduction models of behavior change targeting these groups are important toward the control and prevention of AI spread. One of the South Asian countries which has been significantly affected by H5N1 outbreaks is India. It is estimated that India produces a poultry population of about 480 million, with about 40% of those from backyard farms. India is also the 5 th largest egg producer and 18 th largest producer of broilers. Currently, information is sparse about the level of understanding of AI among poultry workers in India. With the continued H5N1 outbreaks in poultry and increasing concern for its pandemic potential, it is important to assess their awareness regarding this disease. The current study was conducted to further evaluate this bird-human interface. The major focus of the project was to analyze the knowledge, attitudes, and practices of those who work in live bird markets and poultry farms. The two distinct groups were chosen because of the differences in their types of duties and poultry handling. Information regarding differences in awareness and attitudes about AI would assist in developing effective public health interventions. This cross-sectional study involved two groups, live bird market and poultry farm workers, who were considered being at risk for exposure to AI. It was conducted in the two most populous cities in the state of Karnataka in South India-Bangalore and Hubli. Institutional review board approvals were obtained from both collaborating institutions. A sample size of 200 workers was equally divided between the two high-risk groups-Live bird market and poultry farm workers. Sample size (n = 200) for this study was calculated using Epi Info TM . Live bird market workers were directly approached, self-introduced, and informed about the importance of this study. Most of them readily accepted to participate when approached after their peak business times. However, accessing the poultry farm workers was challenging. Local poultry business leaders were first contacted and apprised about the study. Subsequently, through managers and supervisors overseeing local farming activities, poultry farm workers were recruited. Eligibility criteria for inclusion in the study required the ability to provide verbal informed consent, a minimum age of 18 years, and employment as an active live poultry worker. Questionnaires were interview-based, anonymous, voluntary, and confidentially administered at their work site. The survey instrument underwent pretesting among a group of poultry workers to ensure feasibility, validity, and accurate interpretation of questions. The questionnaire was accordingly modified. The instruments included demographics, practice characteristics, knowledge of modes, and vehicles of transmission, risk groups, preventive measures, attitudes toward AI, behaviors regarding actual use of preventive measures, and other pertinent information. The response choices were mostly closed ended. Knowledge questions were given three options-"yes", "no", "do not know" or "agree", and "uncertain" or "disagree" as applicable. The responses to questions regarding attitudes toward AI were given on a five-point Likert-type scale (low to high) to ascertain level of agreement or disagreement. Likewise, five possible options of responses were given, ranging from never to always, to measure compliance with biosecurity practices. A database was created for the responses using Microsoft Access (Microsoft, USA) for analysis. Continuous variables were first assessed for normality, and any missing data (41 questions) were excluded from further analyses. Variables such as education levels and nature of work were categorized. Mean values between each of the groups were compared by t-test. Proportions were compared using Chi-square tests. Multivariable logistic regression models were used to compute odds ratios and their 95% confidence intervals with P values. All statistical testing was performed using two-sided tests with type I error being set at 0.05. Data analysis was performed using SAS 9.1.3 (SAS Institute Inc, Cary, NC, USA). A total of 207 poultry workers-105 in live bird market and 102 in poultry farms-were recruited into the study from June to July 2008, with a response rate of 99%. 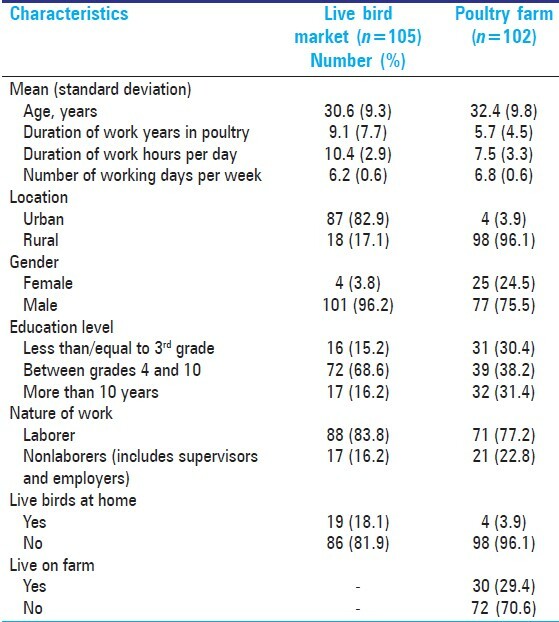 The mean age of poultry workers was similar in live bird market and farm workers (31.5 years) [Table 1]. The live bird market workers had worked for a significantly longer duration in the poultry industry compared to farm workers (9.1 vs. 5.7 years). They were also more likely to be urban dwellers and male. While the bird market workers were more likely to have live birds at home (18%), about 30% of farm workers reported that they actually resided on farms. The mean duration of work per day was longer in bird market workers (10.4 vs. 7.5 h). 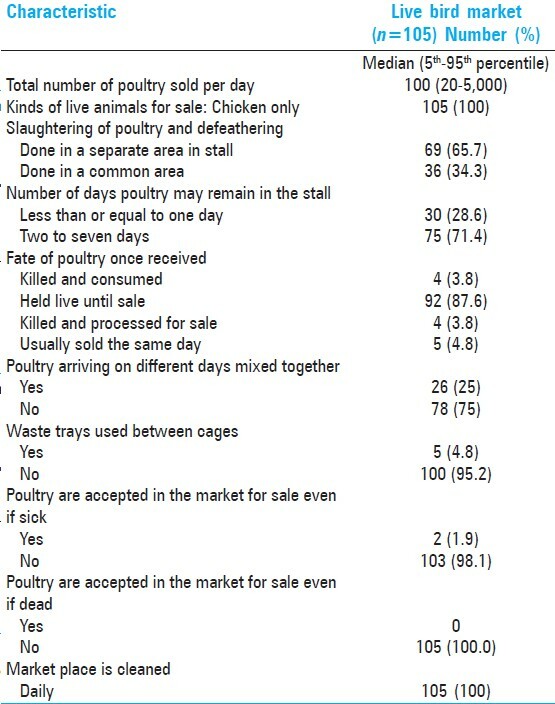 The median number of poultry sold per day in the live bird markets as reported by the poultry workers surveyed (n = 105) was 100 (range 20-5000) [Table 2]. Good biosecurity practices among bird market workers include daily cleaning of work areas with locally available disinfectant and not accepting sick and dead poultry for sale. However, poultry were more likely (87%) to be held live until sale with 71% reporting that these poultry remained on market for more than 2 days. The poor biosecurity measures observed were mixing of poultry arriving on different days (25%), the use of waste trays between stacked cages, and slaughtering in common areas (34%). The median number of flock size maintained by the surveyed poultry farm workers was 16,000 (range 3500-150,000). These farms were almost exclusively broiler farms (99%). A close working relationship was evident between the hatcheries and farm workers. The poultry housing areas, including feeds and water, were well secluded from free roaming birds and animals. Flocks were maintained appropriately only by age and were thoroughly cleaned between batches. Slaughtering was seldom done on farms. Vaccinations were routinely given to all birds. Hand washing was routinely performed, but protective clothing was not worn and clothes were not changed before entering the farms. In addition, footwear was generally not cleaned or changed (median 52.5). When the entire sample (n = 207) was assessed regarding handling of sick or dead poultry and methods used for discarding, several poor biosecurity practices were identified. Some of the sick poultry (50%) and dead poultry (5%) were returned to their suppliers. About 20% of the workers discarded carcasses by leaving them in open areas which poses a major threat to biosecurity. About 60% (n = 123) of the poultry workers had heard about AI, with no significant difference between the live bird market (n = 69) and poultry farm workers (n = 54) in their knowledge of AI. General media, especially television, was reported as the most common source of their knowledge (82%). Among those who reported awareness of AI, about 78% correctly identified its bird-to-bird transmission, but only 47% were aware of its transmission from infected birds to humans. Responses to other categories such as other modes of transmission, populations at risk, and preventive measures were mixed. Few significant differences were noticed between the two groups, although the live bird market workers exhibited less knowledge regarding modes of transmission (bird-to-human transmission, transmission by touching uncooked and infected poultry, and transmission through infected secretions) and the populations at risk. While most workers who were aware of AI had high knowledge regarding measures of prevention, there was a poor correlation with actual practice (Pearson correlation coefficient 0.08). The majority of workers (85%) who were aware of AI considered it as a preventable disease. However, 39% of poultry workers did not think it was a serious disease. A total of 40% of bird market poultry workers were not open to receiving additional information on AI compared to farm workers (<0.0001). 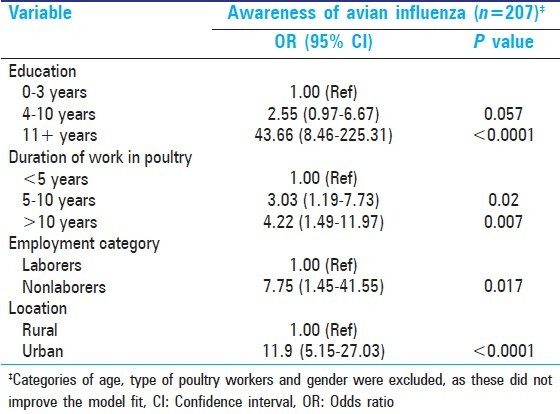 Prior to adjustment for potential confounders, the characteristics such as male gender, higher education levels, longer duration of work, urban dwelling, and nonlabor positions (supervisors or employers) were associated with a significantly higher amount of awareness of bird flu [Table 3]. Workers in higher age groups and those from live bird markets tended to having higher awareness of AI, but this was not statistically significant. 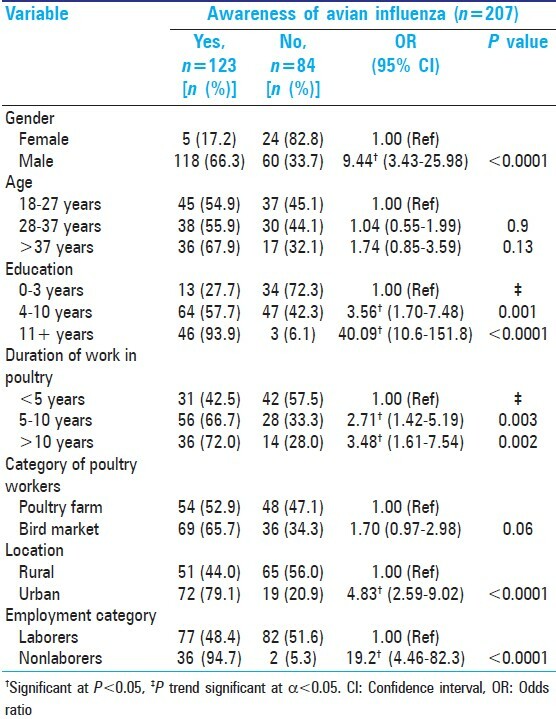 After adjustment for potential confounders, the multivariable logistic regression model revealed that factors like higher education, longer duration of work in the poultry industry, nonlabor employment, and urban dwelling were associated with a higher chance of being aware of AI [Table 4]. Categories of age, type of poultry worker, and gender did not improve the model fit and were excluded from the final model. Multivariable logistic regression was also conducted by probability modeling on good biosecurity practices. After adjustment for potential confounders, the traits of highest education and urban dwelling were associated with higher odds of practicing good biosecurity measures [Table 5]. Categories of age, employment type, duration of work, type of poultry workers, and gender did not improve the model fit and were excluded from the final model. Zoonotic transmission of H5N1 has adversely affected the poultry industry in many developing countries including India, and this directly and indirectly impacts both economic and social well-being. Given this impact, our observations indicate that awareness regarding AI is inadequate. Most poultry workers believed that AI is preventable and not a serious condition. Not surprisingly, their quest for additional knowledge was correspondingly low. In particular, workers in live bird markets were less likely to perceive risk than those who worked in farms. These workers also reported less receptiveness to additional information regarding AI. Interestingly, despite possessing adequate knowledge regarding transmission of AI, poultry workers did not necessarily implement it in their daily practices. While this could be due to their low perception of risk, the lack of resources may also be a limiting factor. A similar study conducted in Italy with poultry workers also found inadequate knowledge regarding AI and low prevalence of biosecurity practice. Other studies , have found continued high-risk behavior through surveys of residents of rural Thailand and Laos during AI outbreaks due to low perception of susceptibility. Multivariable logistic regression models revealed that poultry workers with higher levels of education and longer duration of employment in poultry industry were associated with an increased awareness regarding AI. Urban dwellers had higher awareness of AI, perhaps due to easy access to media. Additionally, nonlaborers such as supervisors and employers had a higher awareness, possibly due to concern for economic impact from an outbreak of the disease. A similar multivariable logistic regression model for biosecurity practice revealed a positive correlation for higher levels of education and urban residence. A major strategy for controlling AI and eliminating the possibility of a pandemic outbreak is to practice biosecurity. In the broadest terms, this serves to prevent the H5N1 virus from finding an ecological niche in poultry. Toward this end, interventions are proposed at both community and public policy levels. , If improved biosecurity measures are implemented and maintained, they reduce the risk against virus introduction and amplification. Poultry farm and live bird market workers have been found to be the weakest link in the chain of events leading to pandemic outbreaks caused by AI. , Public health measure tailored to this population should be considered. In addition, altering human behavior to practice biosecurity, as done with many diseases, is of prime essence. Since television is an important source of information for most workers, use of this as medium for dissemination of information in local/regional languages is as an attractive option. In Thailand,  public health educational campaigns and general media reports about AI appear to have been effective in reaching populations at high risk. Unfortunately in the same study, despite widespread knowledge about AI and effective means of protection, many at-risk groups did not change their behavior. The state of Karnataka where this survey was conducted had not officially had any outbreaks of AI. This may partly explain the lower level of awareness about AI. A recent study in Afghanistan  found that greater knowledge was associated with residence in affected provinces. In fact, their low level of knowledge would be reason enough to direct educational campaigns to areas least affected by the virus in an effort to prevent epizoonoses of AI. One limitation of this study is that the findings may not be generalizable to other areas of the country given its diversity. The highly pathogenic AI virus has become endemic among domestic poultry in certain areas of Asia, Europe, and Africa with sporadic infection among humans, especially among those who come in direct contact with infected poultry. Targeting high-risk behaviors that enhance avian virus transmission among at-risk groups and changing them to comply with a higher standard of biosecurity, such as requiring those who come in contact with dead poultry to wear disposable masks or gloves and even use clothes to cover their nose and mouth, and encouraging the use of plastic bags for their hands, and enforcing hand washing with soap and water, could be starting points (risk-reduction model). Other strategies to prevent and control AI are (a) providing knowledge on AI through group meetings with field veterinarians, and live bird market and farm poultry workers, (b) providing training to workers in hygienic practices with innovative approaches like movies, television demonstrations, and hands-on training with reinforcements every six months, (c) interacting with meat hygiene authorities and regulatory veterinarians to encourage specific hygienic practices in poultry farming and in the processing units, (d) educating the public about specific handling and cooking practices via radio, television and billboards. The results of this study illustrate that respondents had low knowledge about AI, low perceived risk of experiencing AI, and low compliance with preventive behaviors. Therefore, public health interventions that design and implement AI educational programs, especially those pertaining to the practice of preventive approaches, should be implemented. Similar survey studies could be conducted in the future to assess the effectiveness of interventions implemented. Another possible area of study would be to compare urban and rural populations regarding their knowledge, attitudes, and practices in relation to AI. 1. Avian influenza. Fact sheet. Updated April 2011. Available from: http://www.who.int/mediacentre/factsheets/avian_influenza/en/ [Last accessed on 2012 May 13]. 2. Unprepared for a Pandemic: Osterholm MT. Foreign Affairs. March-April; 2007. 3. Poland GA, Jacobson RM, Targonski PV. Avian and pandemic influenza: An overview. Vaccine 2007;25:3057-61. 4. Avian influenza. Bird flu; H5N1. A.D.A.M. Medical Encyclopedia. Available from: http://www.ncbi.nlm.nih.gov/pubmedhealth/PMH0004522/ [Last accessed on 2012 May 13]. 5. Cumulative number of confirmed human cases for avian influenza A (H5N1) reported to WHO, 2003-2012. Available from: http://www.who.int/influenza/human_animal_interface/EN_GIP_20120607CumulativeNumberH5N1cases.pdf [Last accessed on 2012 Jun 12]. 6. Dinh PN, Long HT, Tien NT, Hien NT, Mai LT, Phong LH, et al. World Health Organization/Global Outbreak Alert and Response Network Avian Influenza Investigation Team in Vietnam. Risk factors in human infection with avian influenza A H5N1, Vietnam, 2004. Emerg Infect Dis 2006;12:1841-7. 7. Olsen SJ, Laosiritaworn Y, Pattanasin S, Prapasiri P, Dowell SF. Poultry-handling practices during avian influenza outbreak, Thailand. Emerg Infect Dis 2005;11:1601-3. 8. Ly S, Van Kerkhove MD, Holl D, Froehlich Y, Vong S. Interactions between humans and poultry, Rural Cambodia. Emerg Infect Dis 2007;13:130-2. 9. Mounts AW, Kwong H, Izurieta HS, Ho Y, Au T, Lee M, et al. Case-control study of risk factors for avian influenza A (H5N1) disease, Hong Kong, 1997. J Infect Dis 1999;180:505-8. 10. Kung NY, Morris RS, Perkins NR, Sims LD, Ellis TM, Bissett L, et al. Risk for infection with highly pathogenic influenza A virus (H5N1) in chickens, Hong Kong, 2002. Emerg Infect Dis 2007;13:412-8. 11. Wang M, Di B, Zhou D, Zheng B, Jing H, Lin Y, et al. Food markets with live birds as source of avian influenza. Emerg Infect Dis 2006;12:1773-5. 12. Influenza at the Human-Animal interface (HAI). Available from: http://www.who.int/influenza/human_animal_interface/en/ [Last accessed on 2012 May 13]. 13. Peiris JS, de Jong MD, Guan Y. Avian influenza virus (H5N1): A threat to human health. Clin Microbiol Rev 2007;20:243-67. 14. Government of India. Available from: http://dahd.nic.in/birdflue.htm (2009) Up-to-date on avian influenza epizoonoses in India. [Last accessed on 2009 Mar 11]. 15. Livestock industrialization, trade and social-health environment impact in developing countries: A case study of Indian poultry sector: Mehta R, Nambiar RG. 2002 Submitted to International Food Policy Research Institute. 16. Available from: http://www.cdc.gov/epiinfo/ [Last accessed on 2009 Mar 11]. 17. Abbate R, Giuseppe G, Marinelli P, Angelillo IF. Knowledge, attitudes and practices of AI in poultry workers, Italy. Emerg Infect Dis 2006;12:1762-5. 18. Barennes H, Martinez-Aussel B, Vongphrachanh P, Strobel M. Avian influenza risk perceptions, Laos. Emerg Infect Dis 2007;13:1126-8. 19. Available from: http://www.fao.org/docs/eims/upload/206313/AImanual_vietnam_en.pdf, A guide to veterinary paraprofessionals in Vietnam [Last accessed on 2009 Mar 11]. 20. Available from: http://www.searo.who.int/LinkFiles/Publications_and_Documents_WHO_WetMarket.pdf. Public health interventions for prevention and control of avian influenza, 2006 [Last accessed on 2009 Mar 11]. 21. Capua I, Marangon, S. Control of avian influenza in poultry. Emerg Infect Dis 2006;12:1319-24. 22. Leslie T, Billaud J, Mofleh L, Mustafa, Yingst S. Knowledge, attitudes and practices regarding avian influenza (H5N1) in Afghanistan. Emerg Infect Dis 2008;14:1459-61. 23. Avian Influenza: Current H5N1 Situation. Department of Health and Human Services, Center for Disease Control and Prevention. Available from: http://www.cdc.gov/flu/avian/outbreaks/current.htm [Last accessed on 2012 Jun 03].